Are you worried at all that there might not be work for your child in the future because of all the tasks now being completed by technology? Most of us have seen people replaced by machines at work. Don’t we all now type our own letters and reports? This is much different than 20 years ago. Many factory jobs and research jobs have certainly been given over to machines or technologies of some kind, so it is reasonable as a parent to be worried about technology replacing many of the jobs your child might like. I’ve recently read two books related to this concern. One is Joseph E. Aoun’s Robot- Proof – Higher Education in The Age of Artificial Intelligence and the other is Jay Richard’s The Human Advantage: The Future of American Work in an Age of Smart Machines. While I’ve reviewed both these books, I have also contemplated what their messages tell us about how to prepare children and youth for the future and a very different job market – a job market that we cannot even imagine accurately. In one of the books mentioned above, Robot-Proof, the author speaks about the literacies our children need to manage this uncertain future. These include data literacy, technological literacy and human literacy. It is with respect to human literacy, I believe, that parents can have the most impact on preparing their children for the future. Human Literacy is acquired as we learn to communicate with each other, to create solutions and to design new systems. All these skills are supported by our relationships and by the kind of knowledge best acquired in conversations and human interactions. Children long for interaction and, while it takes time at the end of along day or at breakfast on a morning when you’re rushing to leave, it is exactly these situations that help children learn the problem-solving communication skills they will need in the future. They will also need to embrace any kind of change. To be accepting of change, we must have confidence. I have always been a bit fearful and when I was a young mother, I worried a lot about transmitting my fearfulness to my children. I learned to grit my teeth when they did normal things that were outside my comfort zone because I knew this was important. I always wondered if I was successful at this and it was my 5 year old daughter who convinced me one day that I had been. Her 4 year old brother had taken a tumble off the play structure and was bleeding. As I rushed over, clearly frantic, she called to me, “Mom, stay calm. You’re a doctor!” She had more confidence than I did. Along with communication skills and confidence, a love of learning is the final gift that parents and families can give their kids. Too often we think about school when we think about learning, but not everyone learns well in a classroom – in fact some of the most successful people did not. We know that Einstein was terrible at math and Winston Churchill did poorly when he first started school. I learned about how the future can be fast and slow in a place that never quite caught up to modern times. The picture below was taken from an article in the Globe and Mail. It is an image of the farm where I spent summers as a teenager on part of my summer break. 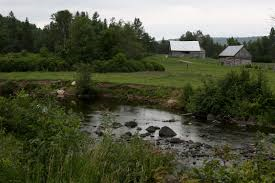 The picture looks out over Constant Creek near Mount St. Patrick, Ontario, at the outbuildings of a farm. At the times that I visited, the farm had no electricity, and only cold running water. It was the early 1970’s and all the food that was needed was grown on the farm. I remember that my family who lived there were shocked that it would cost 7 dollars to buy the other supplies they needed to last until the fall. It could have been another century. Twenty-five kilometres away, it was an entirely different world in Renfrew. In Montreal, where I was attending McGill University, it seemed to be hundreds of years into the future from these few acres of land. Nothing taught me more about change than being in a place that stood still. The future is coming, but the learning we get from people and places can make time stand still, and that’s an appreciation a robot will never have. Nicely written. I very much enjoy sharing your thoughts on how I as a parent and an educator might prepare our youth for the future. Thanks for your robot-proof assessment. Thank you for reading this, Rob. From the books I’ve been reading, I love the reminder that there are uniquely human qualities that a robot will never learn and that we can foster in youth.